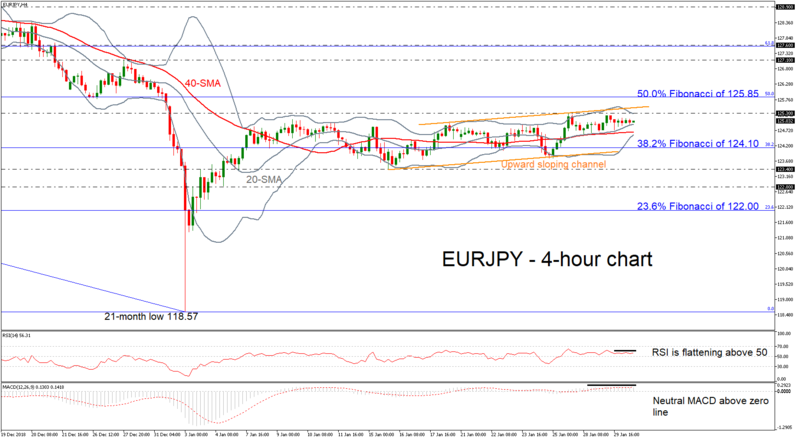 EURJPY has struggled within an upward sloping channel over the last couple of weeks finding strong resistance obstacle around the upper Bollinger band. According to the technical indicators, in the 4-hour chart, the RSI and the MACD are slightly losing momentum above the neutral threshold of 50 and the zero line respectively. It is worth mentioning, that the Bollinger bands are squeezing the price action, suggesting a possible strong break outside of the channel in either direction. If the market pushes the pair higher above the upper Bollinger band, prices could challenge the 50.0% Fibonacci retracement level of the downleg from 133.10 to 118.57 around 125.85. More advances would likely open the door for the 127.10 resistance, taken from the highs on December 27. On the flipside, if the market manages to turn to the downside again and slips back below the 20- and 40-simple moving averages (SMAs), the pair could touch the lower Bollinger band around 124.45. In case of an extension below these lines, the 38.2% Fibonacci of 124.40 could be in focus. Another step lower may reach the ascending trend line of the channel around 124.00.